Impresionante ático con vistas panorámicas en primera linea de playa en Fuengirola, Costa del Sol. Esta recién reformado todo, los muebles todos nuevos. Este ático goza de inmejorables vistas al mar, a la ciudad y a la montaña.Tiene 3 dormitorios y 3 cuartos de baño. El dormitorio principal tiene baño en suite con jacuzzi. Amplia terraza con barbacoa, perfecta para tomar el sol o simplemente disfrutar de las maravillosas vistas. Cocina totalmente equipada y amplio salón. Por favor tenga en cuenta que el ático se encuentra en la planta 17. Los ascensores suben a la planta 16 por lo que hay que subir 1 planta a pie. *Limpieza final 70 euros se paga a la llegada en efectivo. *Entrada despues de las 20:30 hasta las 00:00 coste extra 30 euros. *Cuna y sillita coste extra 30 euros por peticion previa. We had great holidays in Fuengirola. The penthouse was very clean, nicely decorated and furnished. Ideal location, wonderful beach, nice swimming pool and garden and amazing views to the beach and mountains. Unforgettable experience to live on the top of everything! We also found the booking process was very well managed by the property manager, who turned out to be very service minded and supportive. We would choose it again for our holidays! The penthouse is compact but very well equipped. 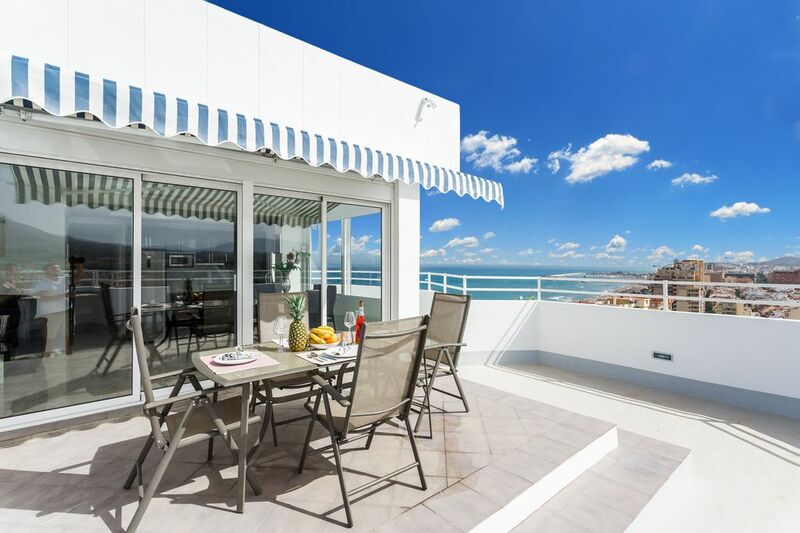 The terrace is fantastic and you feel a sense of security due to height of the walls surrounding the apartment. The views across the sea , town and mountains are amazing and the memory of the sunset and sunrise will stay with me for a long time. Vue splendide, les montagnes, la mer, la ville. Près de toutes les facilites, train, epicerie, marché, resto, bar. Anastasia est un amour, toujours disponible et efficace, un grand merci. A view to die for. Stunning. First impression wasn't great as entrance lobby on ground floor was dated as are the lifts, then you get to the apartment and WOW just WOW. The place is newly refurbed to a high standard and has all mod cons you would have at home. Air con in every room, remote shutters on every window, lots of large windows to give a much bigger feel and then the views. I can't put into words how spectacular the sun rise and sun sets are. On a clear day you can see the mountains of Morocco in the distance. Very comfortable beds with amazing views from bedrooms. Loads of great bars and restaurants within a few minutes walk of property, some serving a very British menu and some traditionally Spanish serving great value for money dishes. Local supermarket, bakers, butchers and bars bars bars still retaining typical Spanish charm. We went as a family of 6 adults and had more than enough space so as not to feel overcrowded. We are now all looking to book again for next year, yes it's that good !!!!! Very nice apartment and the host Anastasia did everything to help us :-) I will definitely come back an rent the apartment. La limpieza final (70 euros) se pagará a la entrada en efectivo. *Final cleaning fee 70 euros has to be paid on arrival in cash *Late check in : between 20:30-00:00 at extra cost 30 euros. Entradas entre las 20:00-23:00 coste extra 30 euros. *Please contact us if you arrival is after 00.00.